The Tampa Bay Lightning survived a furious late-game comeback from the Washington Capitals in Game 5 to win 3-2 and take a 3-2 series lead in the Eastern Conference final. 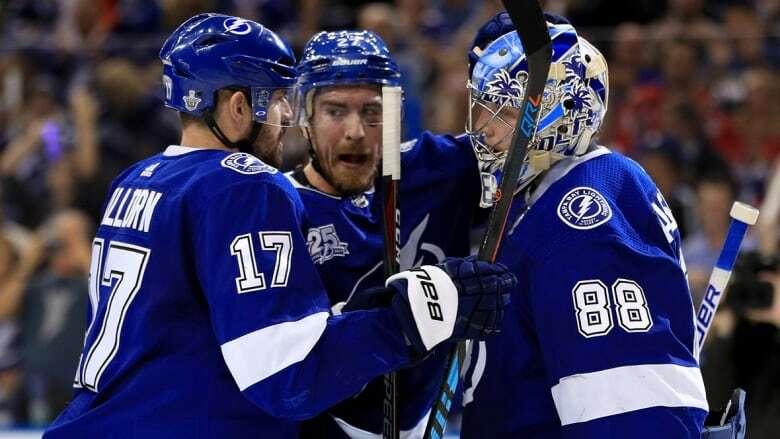 Ondrej Palat and Ryan Callahan also scored as the home team won for the first time in the best-of-seven matchup, with Tampa Bay taking a 3-2 series lead and moving within one victory of advancing to the Stanley Cup Final for the second time in four seasons. "Let's be honest," Cooper added. "You've got to get four, not three." Ovechkin scored with 1:36 remaining, trimming what once was a three-goal lead to one, however Vasilevskiy made three more saves to finish the victory. Game 6 is Monday night in Washington, where Tampa Bay has already won to improve to 5-1 on the road this post-season. "We have a lot of unfinished business. This isn't even close to being over," Callahan said. "This last game's definitely the hardest against a very, very good Washington team. "To go in their building and try to close it out is going to be tough." The Capitals were encouraged by the way they finished the game and are confident they can force the series back to Tampa for Game 7. "This group has got its backs against the wall, and this group has responded all year," coach Barry Trotz said. "I don't expect anything different." The Capitals won the first two games on the road, scoring 10 goals on Vezina Trophy finalist Vasilevskiy and sending the Lightning — won had the best record in the East during the regular season — into desperation mode. Tampa Bay responded by winning Game 3 in Washington, evening the series despite being outshot and outplayed for sizeable stretches of a 4-2 victory in Game 4 and returning home, where Cooper was confident the Lightning would be better than they were in the first two games. Turns out Cooper was right. Washington's Dmitry Orlov turned the puck over in the neutral zone on the opening shift of the night and Callahan made the Caps pay for the mistake, feeding Paquette for a 1-0 lead just 19 seconds into the game. Palat's second goal of the series made it 2-0. Tampa Bay extended the advantage to three goals when Callahan scored 33 seconds into the second period. Outshot 13-4 and limited to one scoring opportunity in the opening period, the Caps began to put some pressure on Vasilevskiy in the second. Evgeny Kuznetsov scored a goal in his fourth straight game, giving him a franchise single-year, playoff-best 22 points (11 goals, 11 assists) and trimming Washington's deficit to 3-1 at 4:21 of the period. The Capitals kept pressing in the third period, but didn't breakthrough against until Ovechkin scored his 11th goal this post-season. "It's not frustrating," Ovechkin said. "Of course, when you lose a game you feel bad. We just had a bad start. We didn't handle the puck in the neutral zone. They got a lucky bounce and put in the first goal. That gave them momentum." "It's disappointing, but I thought our second two periods were great," Capitals winger T.J. Oshie said. "We showed a lot of character. Character doesn't always win you games, but I think it's going to be important to have that feeling going into Game 6 at home."